Yesterday, our post about AOL’s promotional discs by way of an excellent thread on Quora invoked quite a bit of feedback. That’s hardly surprising given that every man, woman, and child (at least in the United States) probably had their hands on one of the discs at some point in the 1990s. In fact, Jan Brandt, AOL’s former Chief Marketing Officer, dropped a huge knowledge bomb in the Quora thread after we published our original post: “At one point, 50% of the CD’s produced worldwide had an AOL logo on it,” she wrote. Wow. And she followed up today in a new thread with even more interesting information about the program. Specifically, someone asked: What was the Conversion Rate of AOL CDs in the 1990’s? Given how widespread the discs were, you might think AOL wasn’t (or wasn’t able to) monitor the rates so closely. But they were, according to Brandt. “The profitability of each and every disk and promotion effort was tracked and analyzed. We conducted approximately 2000 different tests each year and used these results to develop future programs. Despite the label ‘carpet bombing,’ there was actually a very high level of marketing sophistication and almost all decisions were data and results driven,” she writes. While she didn’t have any singular statistic to share, she does say that the first large mailing program began in the Spring/Summer of 1993, with about 200,000 discs (technically, still 3.5-inch floppy disks at the time) and other non-disk mailing being sent out at that time. “The average response to that mailing was a staggering 10%– unheard of in direct marketing– or any marketing circle,” she notes. Incredibly, each floppy disk cost AOL $1.19 to make at first. And that’s just for the disk. That doesn’t include any of the other packaging they were sent in. “Part of the success of the marketing program was also dependent on dramatically driving down the costs of producing and mailing the disks and packages,” Brandt writes. As former AOL CEO Steve Case noted yesterday, they were able to do just that. And that’s why we saw so many of those disks (and eventually discs). “At the time of the initial tests there were no machines that could assemble these packages automatically. We worked with vendors to develop automated equipment and could not have scaled the marketing programs without first developing this equipment,” Brandt writes. The strategy worked as AOL perfected the system enough that it was cost-effective. Soon, they were signing up a new user every six seconds. A few years later, they were a $150 billion company. Brandt also humorously notes that the (annoying) disc image we used yesterday in our post wasn’t actually one AOL widely sent out. Instead, it was one of the many test discs AOL was trying at the time. 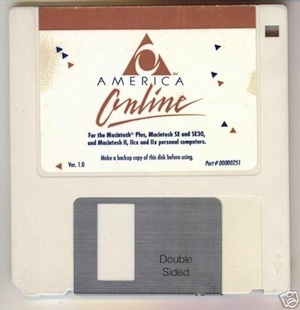 I actually remember the floppy disks better than the CDs because I was actually excited to get the floppies back in the day to try out the latest version of AOL. A few years ago, CrunchGear noted an AOL 1.0 disk selling for $5,000 on eBay. Which is awesome. Just in case you’re new to TechCrunch, yes, AOL now owns us. Clearly, that has nothing to do with why we’re posting this. Or does it? You’ll never know.